But these billboards are just a McGuffin so we can get to know and follow our three main characters, Mildred, Chief Willoughby, and Willboughy's (racist) protege Dixon (Sam Rockwell). The town of Ebbing takes offense to Mildred's billboards, and Mildred, with zero fucks left to give, gives The Town one helluva fight back. McDonagh creates wonderful and entertaining three dimensional characters, and McDormand, Rockwell, and Harrelson make the most of what is on the page and give Oscar-worthy performances, but where Three Billboards stumbles is that is fails to capitalize upon its smart and darkly funny premise. I understand that Three Billboards is a Black Comedy, and as a fan of Martin McDonagh's previous two films, In Bruges and Seven Psychopaths, I understand the tone and point that this auteur is trying to say, but even with all of that, Three Billboards feels uneven at best. For a film about consequences - Chief Willoughby dealing with the fall out of not solving a high profile case and Mildred dealing with the fall out of creating the titular three billboards - none of the characters ever really seem to have to deal with the consequences of their actions throughout the film. This becomes extremely problematic when the films deals with Dixon. I love Sam Rockwell and I love this performance, but his character arc begins with him beating a Black person to death while in custody (albeit before the events of the film begin) and ends with a redemption that is never once earned throughout the course of the events on screen. The point of what Martin McDonagh, a man born and raised in the United Kingdom, was trying to say about America seems to have gotten lost in the translation. It seemed to have resonated with the Hollywood Foreign Press Association, a shadowy cabal of 90 or so foreign journalist writing about Hollywood, as Three Billboards Outside Ebbing, Missouri won the Golden Globe for Best Picture (Drama); however, to me, the point seemed forced and rang untrue. I don't inherently mind seeing a foreigner's perspective on American politics and culture, but it needs to be done well and have some sort of accuracy to it- even if that accuracy is only true to everyone but Americans. 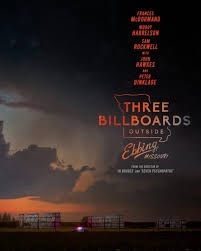 The film's premise, the great acting by the three leads and the strong first act isn't enough to carry Three Billboards over the finish line. I hope McDormand and especially Rockwell get Oscar wins, but I wouldn't spend your hard-earned $15.00 to go see this film in the theaters.